Just south of Smolensk we have struck a small dilemma. While the Russians were re-organising after the Battle of Smolensk, journalled earlier herein, we moved the majority of our army towards Moscow as per their original orders. We now find that the major Russian army is up for another fight and are advancing on our position. All we have is the tired Westphalian and Polish Corps, the attached Vistula Legion and an attached Reserve Cavalry Corps. We have been in position for a few days, so the enemy is advancing and will attack us. We fell back a little way to a group of hills that provided a good defendable position. We waited. Marshal Murat who was travelling with the Cavalry Corps took command of the force and set about issuing orders and positioning the troops. He based our defence on a line of hills just behind the Volskan River. A small village sat on the river where the road to Smolensk crossed it. We garrisonned this with some light troops. 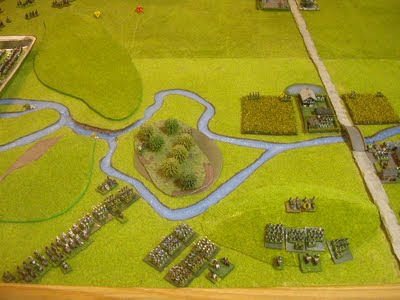 On the hills behind the river we placed artillery and a few brigades of infantry with more guns, infantry and cavalry on either flank. It was at this time my horse was startled by a shot from the front line between skirmishing parties and I lost my balance and was unhorsed resulting in a very dramatic contact with the ground. Marshal Murat was concerned as I was to command the Westphalians again today as I did days ago when the King of Westphalia, Napoleon's brother was killed at the Battle of Smolensk. Murat ordered his surgeon team to me and they moved back to the reserve formations. It was not clear whether or not I would be able to return to my duties, but I was determined to recover.